Yes, I've made it to GBBD after all! And I'm glad to be here and back in the blogosphere in general. Lots of happenings in my little garden over the last few months and now we're in my most favorite time of year. I've been busy planting bulbs and anything else I can get my hands on, including some heleniums, above. I don't think heleniums are supposed to do that well here but I couldn't help myself when I saw them. So far they seem to be faring nicely. Mexican mint marigold (aka Texas tarragon) is one of my favorite fall bloomers. It adds a bright punch to the garden and attracts lots of pollinators. It also is a great Southern substitute for tarragon. I love this little rose. It's very hardy and has a light fragrance. Right now the roses are just starting to put on their fall show. In a couple weeks I'll be smiling big at all the blooms. This aster and the next are a bit of a mystery. My big box store frequently has mislabeled plants but this one had two labels! And it's also got two different colored blooms, so maybe that explains the two labels. I was hoping I was buying the aster below. Both these asters managed to bloom in spring, survive an aster lace bug invasion, and then bloom again in fall. Crazy. This is like two blooms in one! It's that time of year again - time for the hyacinth bean vine to bloom and make pretty seed pods. Dr. Bud Willis, owner of the wonderful native and heirloom nursery in Doyline, Willis Farm, gave me this perennial hibiscus. I've never tried one before and I've been very pleased with it. I only get a couple of blooms opening per day but it's grown 8 feet tall in one year with absolutely no care. From the humongous to the diminutive, my gardening chores are made lighter when I garden around the lovely fragrance of sweet olive. Can't beat a plant that smells this good for almost three seasons in a year. Okay, now I've drifted into Pam's Foliage Followup meme but I know I will be too short on time to do it tomorrow. So here's an ornamental grass I really like - Lindheimer's muhly. With the blooms right now it's about 6-7 feet tall. I bought this purple yucca last year at the Garden Bloggers Fling in Seattle. The second I got it home to the heat of Louisiana it lost its purple color. Fortunately it recovers it when temps cool down. My new mini-deck and pergola! I finally managed to have the mini-deck and pergola built this summer (designed by my friend Alexis, who sadly moved away to Bloomington last year). I'm thinking about painting the back lattice some bright color. What do you think? Be sure to visit Carol on this Bloom Day to see what's blooming across the world. It's all wonderful, Jean, and your photos are first rate! That new pergola looks so welcoming, a great place to sit and view the garden. The trellis looks good now, but would also look good stained a color, or possibly a dark charcoal? Sip a glass of wine for me under that pergola, Jean. Happy belated Blooms Day! Wonderful post - especially since I had never heard of Henry asters - perfect for my Henry garden. Do you think they'll be hardy in Massachusetts? Love your new deck. I'm sure you sit there and enjoy the beautiful blooms in the garden. When I saw that helenium I thought- Hm! I want that and had no idea that it would ever grow int he south. Then I read what you said. Even so I would buy that plant if I saw it in the nursery. Apricot drift is a gorgeous rose. It has my favorite kind of flower blooms. Love your new pergola! It looks like the perfect place to escape the sun and enjoy your garden on a hot summer's day...or spring...or fall. So nice to see all your blooms this fall. My hyacinth bean was hit by our first frost, and now it's a brown tangle that I need to extricate from the arbor trellis, but I certainly enjoyed it while it was blooming. I love your muhly grass; I've lusted after Frances' pink muhly for years, but the white is beautiful, too. Enjoy fall in your garden, Jean! Love the new sitting area under the pergola. A color will be nice. Which one? Great to see some lovely flowers at a time when everything here is fading! Good to see you back. I think that painting the lattice a bright color is a wonderful idea! What a lovely deck/pergola...and I vote yes on adding color to the back. Seeing a lot of asters on blogs these days, but yours are among the prettiest. So fresh looking. 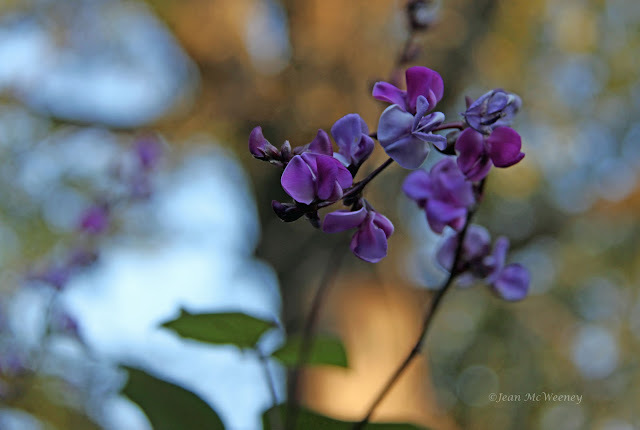 Really luv the hyacinth bean vine bloom. Am I blind or what? Having the hardest time with word verification. Here goes the 4th try. Donna, so sorry about the word verification. I am having the same problem on other Blogger websites. But I have to leave it on because I guess tons of spam. Though I'm not sure how they get past that verification to leave the spam!